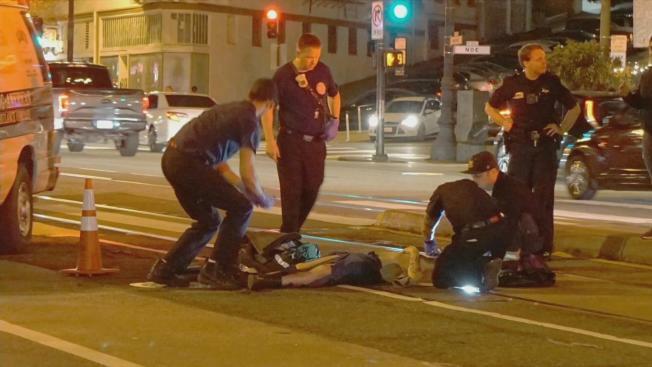 San Francisco residents are demanding change to a dangerous intersection in the Castro District after a man suffered serious injuries from a hit-and-run collision. Surveillance video shows Nick Stettenbenz crossing the intersection at Market and 16th streets Sunday night when he was hit by a vehicle. Stettenbenz, a 30-year-old professional dancer, said he had the green light to cross the street when he was hit by a black car. People who live and work in the area said the six-way intersection is chaos. "It's totally a collision course," San Francisco-resident John Entwistle said. "We've gotta cross the street and it's terrifying." Entwistle took pictures of Stettenbenz being worked on by emergency crews after the crash. Entwistle and other neighbors are now calling for change. The San Francisco Municipal Transportation Agency has changed the timing of the lights, added signage and crosswalk stripes. More changes aimed at improving safety are also in the works, officials said. Stettenbenz said the changes are overdue. "It's a dangerous intersection," he said. "Always has been." Friends have created a GoFundMe account to help pay for Stettenbenz's medical bills. Meanwhile, police continue to investigate the incident.